An opulent ring from Audemars Piguet's Royal Oak collection. 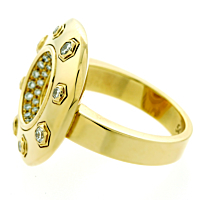 Set in 18k yellow gold, this ring features Vvs clarity E-F color round brilliant cut diamonds. 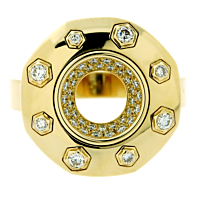 With eight diamonds set on the outer edge and 36 additional diamonds in the center, you're sure to wow with this luxurious statement piece.